The purpose of the accompanying social research study to the Freightvision exercise (Brief No. 226) was twofold: First, we wanted to introduce a concept for accompanying social research of a large participatory foresight process in order to grasp immediate learning effects. Secondly, we analysed immediate learning effects in the course of a large participatory foresight process. The research questions guiding the empirical analysis were: How can we operationalise and measure learning in the context of a large foresight process? Learning thereby involves different levels of learning: individual learning, group learning, organisational learning, system-level learning etc. And how can we operationalise and measure networking, i.e. the establishment of personal ties that enable the exchange of information and hence learning in a large foresight process? The foresight case in focus intended to integrate new knowledge, perspectives and stakeholder groups into an established field. Creating channels for communication between participants from business, policy, civil society and R&D to overcome sectoral boundaries was an explicit goal from the beginning. Stakeholder participation in this case was defined as inviting representatives of research, business, policy and civil society explicitly as “experts” who take part in a strategic dialogue on long-term issues. The expertise of participants was sought as deliberative input and shaped the content and tangible results of the foresight process, leading to robust scenarios, recommended action plans, visions and background reports. Given the large scale of the foresight exercise (up to 90 participants in four fora, budget >3 m EUR, duration > 3 years), deliberative participation was guaranteed through four large and highly interactive fora using large group intervention techniques derived from organisational development theory (world café, open chair discussion rounds, interactive poster sessions etc.). Methodologically, the Freightvision foresight assessed here relied on an overall architecture and methods of organisational development (OD) that focus particularly on changing the thinking and actions of stakeholders. The application of OD concepts and instruments throughout all phases of the foresight exercise was assumed to maximise interaction, collaboration and learning among stakeholders in this foresight system. Learning effects of foresight processes can occur in various dimensions, which we tried to capture in our accompanying social research study: i) the acquisition of social capital (e.g., establishing new contacts, building networks), ii) the acquisition of factual knowledge and understanding (new insights derived from discussions and multiple perspectives), and iii) the development of strategic alternatives (Amantidou & Guy, 2008). Following Lewin (1953), Schein (1995) and Grossman et. al. (2007), we distinguished and applied three different approaches of accompanying social research to analyse and assess the immediate learning effects of foresight. The three approaches were the practitioner model of field research, qualitative interviewing and content analysis. The accompanying research to evaluate the effects of the foresight process on participants and stakeholders was conducted by AIT – Foresight and Policy Development Department. The process involved 165 individual participants coming from private enterprises, interest groups representing the various transport modes, infrastructure providers, trade unions, environmental NGOs, research organisations and administration. Participation in Forum 1 to 4 was between 96 and 75 individuals. In moderated workshops, we conducted a survey and several discussions as part of the foresight process. Within this foresight project group, organisational development (OD) researchers acted as counsellors trying to intervene in social systems in order to provoke change (Schein, 1995; Grossman, et al., 2007). In the context of these moderated workshops, the foresight counsellors and the foresight project group evaluated their roles during the stakeholder fora as well as other impacts by (1) reflecting on and adapting their own observations and patterns of intervention, (2) by evaluating the process as a whole and (3) by carrying out a qualitative survey of the project group in the moderated workshops after each stakeholder forum. The questions addressed mutual learning processes, short-term effects and the evaluation of the overall design and process of the stakeholder fora. According to Schein (1995) and Grossman et al. (2007), researchers participate in the day-to-day life of social systems yet try to minimise influence or set interventions. To capture various kinds of immediate impacts from the foresight case, telephone interviews were carried out after each of forum. Around 20% of the participants were interviewed by the research team, resulting in 71 interviews all in all (the interviews took 15-20 minutes each). Qualitative content analysis was applied to extract information from the interviews. The post-forum telephone interviews showed that participants were positive about the methodology. They were particularly positive about the high levels of interaction during the fora (working intensively in a productive atmosphere, using creative methods including wild cards and visualisation of the freight transport system in 2050), which helped the different stakeholder groups to better understand the motivations and backgrounds of various other stakeholder groups. The interviewees also mentioned that the project led to a systemic picture of the whole longdistance freight transport system across modes. In experimental social research, the observer implements a lab-like environment trying to minimise influence on the observed object. The research setting is designed to generate quantitative data that claims to describe “the reality of the observed object” apart from the observing researcher. In our case, a social network analysis (SNA) approach was applied, reducing the observed part of the complex communication and learning process to different categories of ties established between participants of the foresight fora. Assuming that actors are embedded in a web of social interrelations, SNA provides a set of methodologies and tools to understand internal communication, organisation and aspects of their formation (Heimeriks, Hörlesberger, & Besselaar, 2003; Coromina, Guia, Coenders, & Ferligoj, 2008). A questionnaire was designed and distributed both at the beginning and end of every forum, listing names of participants and asking each participant to quantify the level of acquaintance with all remaining ones. 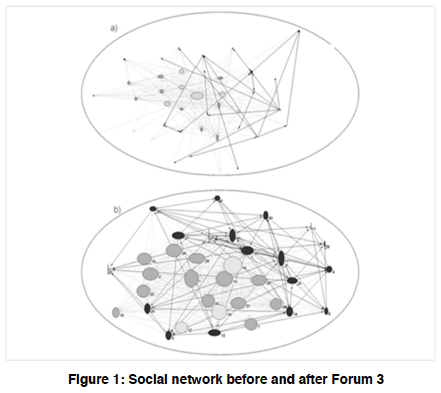 The difference in levels of acquaintance before and after every forum served as a proxy for the number and quality of ties established during the fora (qualitative and quantitative statistical network analysis was applied in order to extract information from the questionnaires). The team of researchers conducting the accompanying social research were external observers. The network analysis based on pre- and post-forum questionnaires showed that the network of participants had already reached a high density after Forum II and that there were no signs of emerging closed clusters of unconnected sub-groups. New participants were integrated quickly (approximately one quarter were new in every forum), and the network density remained stable until Forum 4. Figure 1 shows a network of personal ties (or relationships) between participants based on personalised questionnaires returned a) before Forum I (March 2009, n = 41/96 questionnaires) and b) after Forum III (October 2009, n = 35/79 questionnaires). Stakeholders are coloured in black, all other project partners in grey. Geometric positions and distances are determined by the combined strength of a participant’s ties (participants are positioned closer if ties are stronger). The shape of a node is determined by the number of inward vs. outward ties and its volume by the total number of ties. Network “connectors” have more outgoing vs. incoming ties (ellipses pointed upward) and “authorities” vice versa (ellipses pointed sideward). All computations were performed using the software PAJEK (Chen, 2003). foresight process in focus was captured in different questions. The main result here is that the major achievement of a large participative foresight process with respect to learning is probably that details out of the social contexts and rationalities of various stakeholders add up to a multidimensional picture at the system level. This results in perceiving oneself as being part of a system and gives a clearer view of one’s own role in the system. Interdependencies between the various actors become more apparent, which on the whole results in a more comprehensive big picture at the system level. Thirdly, we tried to empirically grasp the increase of personal ties between participants of a large foresight process by means of a social network analysis. We assumed that these ties reflect some extent of exchange of information and hence can be expected to enable learning processes. Overall, the number of newly formed acquaintances more than tripled during the fora; the network diameter settled at a low size of three ties. A higher density, an average degree of centrality and a lower diameter reflect a higher flow of information. It becomes clearer how participants perceive their position within the network of stakeholders and their influence and future agendas (Schartinger et al., 2011). A clearly discernible effect is the continued collaboration of the project team in the following FP7 calls, which can be attributed to the well-designed collaboration in the project team as active participants in the fora. In addition, the project team held briefing and debriefing sessions before and after the fora to discuss and optimise the networking process. Less can be said about the direct effect of the foresight in terms of relevance to policy documents, as the accompanying research ended shortly after the Freightvision project. In Austria, the results were presented up to the highest ranks of the ministry of transport, which led to the ministry funding a follow-up project (Freightvision Austria, see EFP Brief No. 231) at the national level through the Transport Research Program IV2plus. Media coverage both at the sectoral level (some was very offensive even criticising the scientific evidence) the national level gives some indication of the relevance of the Freightvision process. After the final dissemination conference, DG TREN (MOVE) ordered extra copies of the last management summary for distribution throughout the directorate, which can be seen as a sign of the project’s relevance to internal discussion. In 2012, we conducted some additional interviews to find out whether Freightvision had any direct influence on the White Paper on Transport published in 2011. Although some affirmative statements were made, it is not possible to verify such an influence. The Commission Staff Working Document on the White Paper shows no reference to Freightvision or other parallel FP7 Support Actions. However, several of the 36 measures from the project are mentioned in this document (e.g., CO2 labelling and integration into standards, e-freight, ecodriving training, liberalisation of cabotage, IST, ERTMCS/ETCS etc.). A further step in research on the effects of foresight would be to analyse in depth how participants of a foresight process deal with what they have learnt during the foresight process once they return to their usual surroundings and home environments. In principle, large participatory foresight processes induce participants to carry new impulses to their home organisations. Strategic dialogues and mutual learning processes during the foresight exercise can provide guidance in situations with high degrees of unpredictability and become effective in the organisations the participants originate from. However, it is a great challenge to methodologically grasp the different kinds of effects over time and to isolate the contribution of foresight processes to complex and continuous processes like strategy finding and policy formulation. Determining the contribution of foresight exercises will always be achieved only in part. Although the process was built on a well-founded evidence base, including several models that are also cited in the recent White Paper, it was foreseeable that controversial positions would emerge in the normative phase of the foresight. For reasons of transparency, an effort was made to make dissent explicit and to document minority positions in working groups. 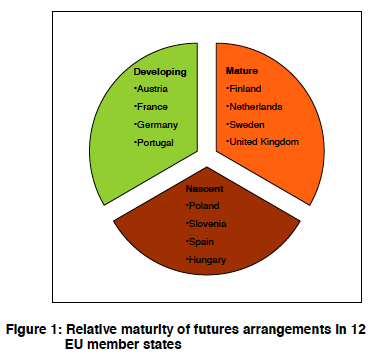 Although it was clear that the project, financed through a FP7 support action, was no formal stakeholder consultation process in preparation of the White Paper, lobbying occurred to the extent that some participants at the final conference were on the verge of boycotting the event because of unfavourable conclusions for a specific interest group. Due to the explicit backing by many of the forum participants who attended the dissemination conference, it became clear that the overall results were valid and that the foresight process had been transparent and sound. Download EFP Brief No. 234_Freightvision_Followup. Amanatidou, E. and Guy, K. (2008), “Interpreting foresight process impacts: Steps towards the development of a framework conceptualising the dynamics of ‘foresight systems’”, Technological Forecasting and Social Change, Vol. 75, No. 4, pp. 539-557. Chen, C. (2003), Mapping Scientific Frontiers. The Quest for Knowledge Visualization, Berlin: Springer. Coromina, L., Guia, J., Coenders, G. and Ferligoj, A. (2008), “Doucentered networks”, Social Networks, Vol. 30, No. 1, pp. 45-59. European Commission (2011), “Commission Staff Working Document – Accompanying the White Paper – Roadmap to a Single European Transport Area – Towards a competitive and resource efficient transport system”, SEC(2011) 391 final. Grossmann, R., Lobnig, H. and Scala, K (2007), Kooperationen im Public Management. Theorie und Praxis erfolgreicher Organisationsentwicklung in Leistungsverbünden, Netzwerken und Fusionen, Munich: Juventa Verlag. Heimeriks, G., H., Hörlesberger, M. and Besselaar, P. van den (2003), “Mapping communication and collaboration in heterogeneous research networks“, Scientometrics, Vol. 58, No. 2, pp. 391-413. Lewin, K. (1953), Die Lösung sozialer Konflikte. Ausgewählte Abhandlungen über Gruppendynamik, Bad Nauheim: Christian-Verlag. Schartinger, D., D. Wilhelmer, D. Holste, K. Kubeczko (2011), Assessing immediate learning impacts of large foresight processes. Submitted to Foresight Journal. Schein, E.H. (1995), “Kurt Lewin’s Change Theory in the Field and in the Classroom. Notes toward a Model of Managed Learning”, available at: http://www2.tech.purdue.edu/Ols/courses/ols582/SWP-3821-32871445.pdf (accessed 2 December 2012). As early as 2003, Manchester Science Parks sponsored a workshop that brought together leading players in the Manchester City region to develop a vision of how universities could contribute to the then newly established ‘Knowledge Capital initiative’. This exercise succeeded in many respects. Not only a vision and the respective action plan was jointly agreed and followed, but the knowledge base was also formed for a later vision creation exercise: that of developing an Innovation System in the Manchester City Region by 2015. The 2003 foresight exercise took place in the context of the strategic review of the Manchester Science Parks (MSP) to improve links between its tenant companies and universities and the city’s interest to capitalise on its concentration of higher education institutions and its cultural and leisure facilities. At the same time, the two most research-intensive universities were in the process of a merger that would later form the UK’s largest university. Thus, the opportunity emerged to drive the process much further over the next five years and secure Manchester’s position as a powerhouse of the knowledge economy. • To develop a shared vision of the future of business–university linkages in the city region of Manchester. The aim was to link the strategies of the universities in the area with the city’s own vision of its future as a ‘Knowledge Capital’. • To move towards a shared vision among senior stakeholders, such as local political leaders, heads of universities, heads of key intermediaries and industry associations, of what success in this area would look like in five years’ time and to begin the process of developing a road map to get there. The workshop was organised following the success scenario process, which intended to develop a shared vision among senior stakeholders and the consequent roadmap to realise this vision. A key element of the method was that those who took part were also in a position to implement the outcomes, which they had already bought into, at least in part, through their own participation and contributions. The workshop participants came from business and commerce, national, regional and local government, intermediary organisations and the city’s four universities. Participants were sent a briefing document setting out the objectives of the workshop and several background documents. The overall design of the process was based on three plenary sessions, interspersed with two rounds of facilitated break-out groups (the first on regional drivers and the second on modes of linkage), articulating elements of the scenario. The output of the workshop was summarised in the form of a scenario for success in 2008. This brought together the key drivers and shapers identified by the participants and highlighted the different but related dimensions of this successful outcome. Five dimensions of change were identified to present the success scenario. · Infrastructure: The reach of the knowledge producers spreads to all parts of the city region: a network of hotspots of university-industry interfaces has spread away from the campuses across the city region. Entrepreneurs are attracted by the combination of café culture and easily located specialised spaces for innovation. The Manchester Science Park brand defines the quality level. · Human Resources: Manchester becomes a net importer of graduates: an exodus of graduates to Southeast England has been reversed as high quality jobs in small entrepreneurial firms attract the best. Rising teaching quality has pervaded the entire Manchester education system with mentoring being one of its hallmarks. Highly qualified and entrepreneurial immigrants are actively sought. · University Missions: Each Manchester university is recognised as world-class in terms of its mission: following the emergence of the new University of Manchester as a world-class, research-driven institution, Manchester’s other two universities achieved similar levels of excellence within the context of their own missions. All three treat reach-out as an integral activity but approach it with distinctive and complementary styles. · Inward Investment: Integrated policies attracts massive investment by multinationals and entrepreneurs: integrated packages combining land use, infrastructure and academic linkages have attracted huge investments by multinationals in the region, providing a natural market for start-up firms. Regional resources are used to gear and attract national and European investment. · Networking: Firms of all sizes and ages in Manchester source knowledge and people and meet development needs from the universities: networking is seen as the key to businesses understanding how universities can help them. Much better interfaces now allow medium-sized firms to work with academics, while business joins city government in securing and supporting centres of excellence. Around 2010, an assessment of the progress made in these five dimensions was carried out.1 In relation to infrastructure it was acknowledged that Manchester City Region had numerous innovation assets that already acted as hubs or that were seeing significant investment over the coming years. In fact, infrastructure was seen as the most developed element of the city region’s innovation system with 69% of survey respondents believing that it was nationally excellent or world-class. However, certain gaps were still present, including specialised facilities such as grow-on space for laboratory-based businesses, specialist incubation facilities, flexible, easyaccess space for a variety of enterprises, and slow development of next-generation broadband and wireless connectivity. In relation to university missions, significant achievements were noted. The new University of Manchester ranking jumped from 78th in the world in 2004 to 41st in 2009. In doing so, it has moved from 24th in Europe to seventh and from eighth in the UK to fifth. The new university was complemented by the city region’s other universities also achieving high levels of success. The scientific strengths were also seen to attract nonuniversity public sector research into Manchester to create a new innovative growth pole for the UK. Survey respondents believed that Manchester City Region’s knowledge assets were world class, more than any other category. A third of the respondents also believed that Manchester City Region was a world-class location for learning. Quality of human resources did not present significant improvements, however. Nearly 30% of city region residents had degrees, but this was no more than the national average and well below the rate in the US. Too many people lacked even basic skills and had very low aspirations, while too many Manchester residents lived in areas ranked as the most deprived in the country. Raising skill levels was identified as the key issue on which the city region should focus in order to raise productivity and tackle deprivation, and further steps were taken in this regard. Nevertheless, perceptions of skills and future potential were positive. Over half of respondents thought that the availability of talented people in Manchester City Region was nationally excellent or world-class. In addition, the high rates of graduate retention (over 50% within 6 months and 91% of these still in the NW after 2 years) were encouraging for raising future skills. The 2003 workshop had an impact on creating an inward investment initiative in Manchester. In 2005, Manchester City Council (MCC), Manchester Inward Investment Agency (MIDAS) and Manchester Science Parks came together to form a partnership, branded as Sino-Ventures in the UK, with funding from the Northwest Regional Development Agency. The scheme was launched as a pilot project aimed at attracting and supporting overseas science and technology businesses, mainly from China, wishing to establish a base in the UK. During the lifetime of the project, 27 companies (from Greater China, USA, India, Germany, Japan, Sweden, Australia and Norway) soft-landed in the Manchester International Innovation Centre located on MSP’s Corridor site. Of these 27 companies, nearly three quarters have remained within the North West region. Moreover, the project supported 70 overseas companies, created 76 gross additional jobs (FTE) and 32 net additional FTE jobs up to February 2008. The inward investment project generated a gross GVA of £4.8 million. In 2010, Greater Manchester still accounted for half of all creative and digital investment in the region. It was also seen to have particular strengths in life sciences and biomedical sciences, accounting for 75% of the sector in the North West, recognised as a member of the ‘European Super League’ of biotech clusters by Strategem, and ranked among the top 50 in the world by Boston Consulting. However, two weak points were also noted in relation to inward investment: lack of international connectivity and linkages and access to seed, start-up and early-stage funding. Finally, several initiatives were set up to increase networking. The Innovation Manchester Boardroom was created, which provides a forum for top private, public and social sector innovators to discuss key issues, challenges and opportunities. It has the primary long-term objective of developing leadership across sectors/interests and changing how people connect and work with each other. The Innovation Manchester Network teams were launched in 2008 in recognition of the need for strong private sector involvement in the push for a more innovative city and the need to develop purposeful crosssector networks for innovators. Innovation Manchester brought together over 70 of the city region’s top business leaders and key city partners, who identified and prioritised ways in which Manchester’s capacity for innovation could be increased and developed those ideas into live projects, such as Manchester International Festival: Creative Learning (MIF Creative), Manchester Masters and Manchester: Integrating Medicine and Innovative Technology (MIMIT). The 2003 foresight exercise achieved its objectives to create a vision for the Manchester City region as well as a road map towards realising it. Five years later, notwithstanding certain gaps, significant progress was marked in all the five success dimensions. The output of the 2003 exercise had additional impacts. The exercise paved the way for a new foresight exercise, commissioned in 2006 by MSP with a more global look at science parks. The main objective of the workshop was to define the next stage of development for mature science parks also called ‘third generation science parks’. In addition, the 2003 exercise formed a valuable knowledge base upon which the next foresight exercise could draw in 2010. The 2010 exercise led to a vision of the Manchester innovation system in 2015 that has seen a step change in its effectiveness and laid out the key actions to get there. The same success scenario process was applied bringing together senior stakeholders from the public, private, academic and third sectors. The vision was built around the idea of an innovation ecosystem that governs and facilitates the flows of people, knowledge, finance and services between the main actors and institutions involved in innovation. Manchester has a reasonable starting position in each of these dimensions, with the knowledge base being the strongest and the access to finance the most challenging. Cutting across all four flows is the need to increase connectivity. Key actions to achieve the vision were defined under five specific dimensions as follows. People and skills: Enterprise and entrepreneurship at the heart of the curriculum, and movement of people and ideas across sectors. An understanding of business and enterprise, of creativity and entrepreneurship should be a core component of the education system and the basis for as natural a career path as employment. Colleges and universities should respond quickly to user input to curriculum design. A city region mentoring scheme should be developed to support understanding and mobility between public and private sectors, between education and business and to allow senior managers of small firms to benefit from the experience of their equivalents in medium and large firms. Innovation ecosystem: Manchester as a market friendly to innovative products and services that links SMEs to demanding customers and harnesses the links between cultural and technological sectors. Public procurement practices should demand innovation and not exclude SMEs through initial qualification requirements. SMEs need help to respond innovatively to the demands of large private sector customers. Crosssector barriers can be broken down by bringing together individuals around key challenges such as creating a low carbon city region. Artists or designers in residence at technology companies should be complemented by technologists in residence at cultural organisations. Demanding innovation: Public services better connected to user demand through engagement, and new products and services trialled in Laboratory Manchester. Public sector management teams can become private sector delivery companies that are responsive to consumer demand, while communities should seek and promote innovative solutions to local social problems. The Laboratory Manchester concept should offer large scale trials built upon the city’s reputation for delivering effective public private partnerships. Manchester should develop a low carbon economy ahead of the curve. Finance: An effective city region proof of concept fund and a business angel network. A city region proof of concept fund should be launched to encourage and facilitate the development of new intellectual-property-based businesses. At the same time, business angel activity in the city region should be encouraged by enabling wealthy individuals to learn about investing in innovative companies, preferably from previously successful angels. Telling the story: A coherent narrative about the Manchester innovation ecosystem developed that helps to coordinate the messages about the attractions of Manchester as a place to live, work and play. Manchester should have a coherent narrative about its innovation ecosystem built on its history but focused on present and future strengths in the low carbon environment, health and life sciences, sports and new media. The narrative should be used to inform a coordinated talent marketing strategy to attract the best students and workers. This should be supported by a Web 2.0 platform that would provide access to innovation stories and also to technological opportunities with market potential. Download: EFP Brief No. 230_From Knowledge Capital to Innovation System. Georghiou, L., Davies, J. (2010): An Innovation System for the Manchester City Region, Manchester Science Parks Ltd.
Georghiou, L. (2008): Universities and the City-Region as a ‘Knowledge Capital’ 2008, Foresight Brief No. 14.
www.mspl.co.uk, last accessed 9 November 2012.
www.manchesterknowledge.com, last accessed 9 November 2012. New technologies can improve our quality of life greatly, but they may also have a “dark side”. The objectives of FESTOS were to identify and assess evolving security threats posed by the potential abuse of emerging technologies and new scientific knowledge, on the one hand, and propose means to reduce the likelihood of such threats, on the other. Looking ahead to the year 2030, this foresight study scanned the horizon of different fields of technology. Possible means of prevention and policy measures were studied in the context of trade-offs between security needs and the freedom of research and knowledge. The FESTOS project (Foresight of Evolving Security Threats Posed by Emerging Technologies) identified and assessed evolving security threats caused by the abuse or inadequate use of emerging technologies and areas of applied research. Looking ahead to the year 2035, FESTOS scanned the horizon of fields such as nanotechnology, biotechnology, robotics, new materials, and information technology, as well as capabilities that might emerge from converging technologies. FESTOS identified and evaluated these potential threats on the horizon. Based on this scanning, FESTOS stimulated “out of the box”, forward-looking thinking and constructed “threat scenarios”. Finally, FESTOS recommended policy guidelines designed to minimise the probability of these evolving security threats materialising. Possible means of prevention and policy measures were studied in the light of trade-offs between security needs and the freedom of research and knowledge while taking into account shifts in the public perception of threats and related security issues. To identify new, potentially threatening technologies. To assess emerging threats and – based on a selected set of potential threats – to construct scenarios with appropriate early-warning indicators. To draft preparatory measures and policy guidelines. As all foresight studies, FESTOS did not aim to predict the future. Instead, the project sought to raise awareness and initiate a debate among and between scientists and policy-makers about the possible “dark sides” of future technologies. The FESTOS team carried out a horizon scanning of emerging technologies that might pose security threats in the future if these technologies are abused. Furthermore, an assessment of the potential threats was carried out. The first result was a structured description of around 80 “potentially threatening” technologies in the six fields listed above. The next step was to evaluate the threat aspects of 33 selected technologies by means of an international expert survey in which 280 experts participated. The collection of technologies was not intended to be exhaustive but to stimulate further discussions and provide a basis for the subsequent analysis. As such, it can serve as a “dynamic data bank” of potentially “abusable” technologies. Subsequently, the results of the expert survey were analysed in terms of the likely time spans for the threats to materialise, prioritisation (relative impact of each technology), the nature and extent of the potential damages, as well as societal issues. This activity included ranking and selecting security threats for scenario construction. In methodological terms, the exercise included expert brainstorming sessions, a security assessment (including Ansoff filters and the STEEPV method), an analysis of the relevant signals of change and wild cards. Four narrative scenarios based on the identified security threats from emerging technologies were developed. The aim of the scenarios was to depict possible futures that take into account the social dimension and the interdependency of different impacts. In a scenario workshop, five methods and procedures were used: wild cards, security climates, futures wheel, security café for impact analysis and brainstorming. The possible control of scientific knowledge to prevent unintended new security threats is a very sensitive issue in open democratic societies. FESTOS raised a debate on whether and how to control emerging science and technology developments in order to prevent abuse without slowing down the process of knowledge creation needed for innovation, progress and improving human life. Secondly, FESTOS analysed the problematic issue of controlled dissemination of scientific knowledge in the light of the inevitable trade-offs between security and freedom of research and knowledge creation. The methods used were an online survey of approximately 100 selected experts and representatives from various parts of society, followed by 5-10 semi structured in-depth interviews in each of the participating countries (Poland, Germany, Finland, UK and Israel) with selected key actors representing civil society and other relevant organisations, and, finally, an international workshop on control and prevention, with the participation of invited experts and representatives. Examination of the diverse technologies led to identifying three broad categories of potential threats: The first category is the disruption of certain technological applications for malicious purposes (for example, jamming communications in intelligent collision avoidance systems in transportation). The second category concerns the increased availability of technologies that once were confined to the military or to unique, heavily funded laboratories and were prohibitively expensive. The third category concerns surprising malicious uses of new technologies developed for completely different, beneficial and civilian purposes. The most interesting for FESTOS seemed to be the third category, where we found the most unexpected threats, signals of change or surprising “wild cards”. For the time scale 2015 – 2020, the following potential “wild card technologies” were identified (i.e. technologies with high severity threats and a low likelihood of actual abuse): swarm robotics, brain implants, water-catalysing explosive reactions, future fuels, self-replicating nano-assemblers, medical nano-robots, ultra-dense data storage, meta-materials with negative light refraction index and synthetic biology. Swarms of cyber-insects attack people and animals. Individual DNA is misused for purposes of extortion. Intelligent everyday nanotechnology-based products can be set to self-destruct, which is triggered by a wireless signal. A terrorist group uses a virus to change the behaviour of a portion of the population for a certain period of time. measures developed by the media to limit the publication of sensitive knowledge. Codes of conduct, internal guidelines (bottom-up approach) and legal regulations are perceived as the most effective control measures. There is a need for networking, international cooperation and broader expert panels to evaluate emerging technologies continuously with respect to possible unintended effects relevant to security. More detailed technological evaluations are required in the short-term, and it was suggested that at least sixty to eighty technologies need to be evaluated. FESTOS provides a starting point to cover all the risks and work towards a EU risk strategy in different areas of science and technology. In addition, there is a need to cooperate much closer with the EU patent office and with patent agencies around the world. It is furthermore very important to secure financing in Horizon2020 to allow continuing the horizon scanning work carried out in FESTOS. There is a tension between possible security dangers of technology R&D and academic freedom, and there seem to be only two “stronger” control measures that academics are willing to accept: internal guidelines in research organisations and codes of conduct. Codes of conduct are the preferred control mechanism in R&D. Since science and technology is globalised and develops at a fast pace, we can only have ethical control if there are international codes of conduct, to be developed by international organisations. Scientists need to understand the consequences of their research, and this needs to be handled at an international level. There seems to be a difference between democratic and non-democratic countries in this respect. In democratic countries, there is less of a threat that scientists might develop technologies that will be misused. In societies that are more closed and lack democratic institutions, scientists tend to continue their research even if they are aware that their invention might pose a threat to security. In any event, industry has a massive influence, including the ability to effectively lobby for its interests. Some of could focus on safe researcher practices, codes of conduct etc. and assist in the creation of an international “control” environment. It is highly desirable that the “dark side” is considered at the beginning of projects. Therefore, it is crucial to develop assessment criteria. It is more effective to build in design control measures during the design phases of the research than to turn to ethical assessment after the research is completed. Such an anticipatory approach results in “security by design”. Another critical element is “networking and networks”, which will be very important in the future. This aspect concerns how scientific organisations are networked to produce results for society. All innovations are based on knowledge, and we must develop knowledge-management systems to manage the dark sides as well. This requires an active role of the EU Commission and European Parliament. There is a need to educate students as early as possible about threats and security issues during their studies at university. Knowledge about these control dilemmas should be added to the universities’ curricula. We also need early media training for children since they will encounter a number of challenges as they increasingly navigate an expanding digital universe. Such media proficiency is even more important since the digital universe can be unfamiliar or even unknown to their parents, who are “digital immigrants”. The future “digital natives” can only cope and shape the digital universe if they are properly informed and know how to protect themselves. Actors and decision-makers, as they balance security needs, the requirements set by open democratic societies and the freedom of science, should take active measures against the possible dangers of the dark side of technologies. More promising than top-down measures are bottom-up proposals: Instead of legislation and coercive measures with rather questionable outcomes, the FESTOS team proposes to develop soft and optional measures. These measures, first of all, are based on self-regulation, self-control and the education of engineers and scientists. Codes of conduct, ethical guidelines and educational measures may initially be established on sub-state levels but must be developed into national, Europe-wide and global regimes. While self-regulation and education may be the means of choice in most cases, it has to be stressed that there are also exceptional cases, such as weapons of mass destruction, for instance. In these cases, there exist international regimes to regulate the prohibition of research and development of extremely dangerous technologies and, for the most part, the international community complies with the rules. An example is the Biological and Toxin Weapons Convention (BTWC), which was the first multilateral disarmament treaty banning the production of an entire category of weapons.